Yesterday i met near London with one of my learning communities, one with a focus on organisational development and competencies. It was a rare chance to come together with a dozen great people to share ideas, experience and stories. The conversation covered quite wide ground, but the particular theme that resonated with me was about how we balance the short and long term needs of the organisation in an age where change is constant. How do we meet the needs of the organisation, the individual and the client or customer with a contract that is fair and balanced. Who wins, who loses and what are the risks. Today’s post is my narrative of the learning, from my perspective. Applied skills are used in the short term, from a narrow perspective. Reflective skills for the longer term. Change, and the immediate demands that it brings, forces us into a narrow perspective of organisational development needs. In counterpoint to that, the long term viability of a business requires someone to take the long view, a wide viewpoint, to be able to rise above the immediate challenges and develop the vision. It requires specific and different competencies, different skills. 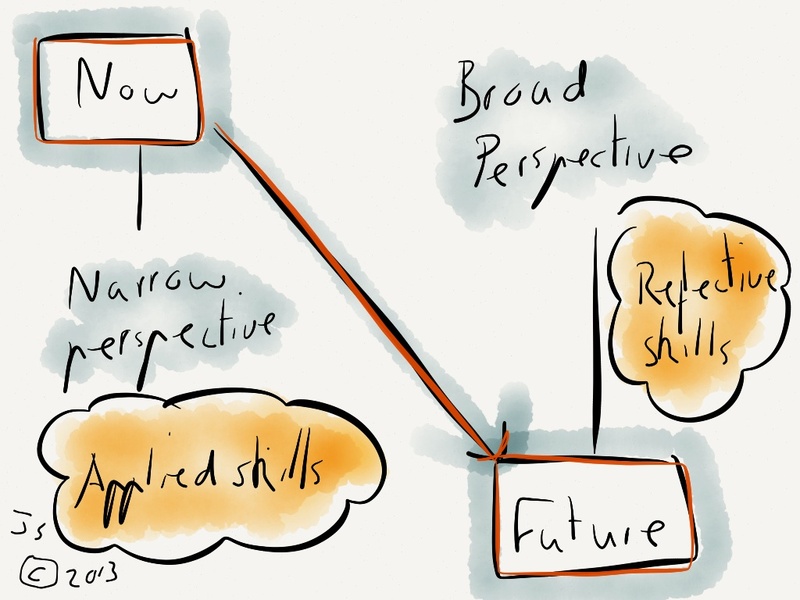 I’m simplifying it somewhat, but lets call those immediate, skills ‘applied’ (ones with immediate application) and the longer term ones ‘reflective’ (from the wider, longer, vantage point). Everything at the coalface moves us ever closes to short terms cycles of problem solving and reaction, fire fighting or, at best, a project wide perspective: applied skills. But this culture may not foster the innovation and creativity that are needed for longer term viability, be that engineering excellence, customer service or science: reflective skills. Some skills take a long time to build and the experience comes at a cost. Within a healthy skills ecosystem, we need talents that are not deployed everyday, but from which we can draw agile teams in the future. We need applied and reflective. There is a background to this discussion as well: the changing nature of work in the Social Age. When the fundamental bond of trust between employer and employee is broken, our view of ‘work‘ becomes ever shorter and narrower, whilst our view of the skills we need to curate ourselves becomes broader. Our focus can (and probably should) be on the nature of the skills we need to hit targets today (applied), but there needs to be an organisational willingness and individual drive to develop those wider, reflective, skills. We need to create space for people to grow within, space that sits outside of immediate, short term needs. These immediate skills may come at the expense of developing a visionary approach, of developing deep expertise. As our relationship with knowledge changes, as we need to be more agile to succeed, we may need to actively curate our skills across both applied and reflective spaces, immediate and longer term views. If you don’t have the long view, who does? Aligned with this personal curation of competencies comes the question of how the organisation deals with knowledge: does it lock it away or make it more accessible? When knowledge itself is no longer power, merely the fuel for creating meaning, the foundations for agility, we need to break down organisational barriers, silos where knowledge is hidden, to support a more social approach to learning. One very interesting theme, one very encouraging, were the wide and varied ways in which organisations are developing and engaging with social learning groups. These are starting to be seen increasingly as structures of power, groups that need to be engaged with. Whilst this is good, it did bring up questions of social capital and the need to avoid inequality, disenfranchisement of a minority. Certainly there was a recognition that we need to include development around these areas. So that’s my own narrative of the learning: it’s a fraction of what was covered and it’s from my interest and perspective, but it has no immediate application for me, it’s part of my reflective, longer term learning. I hope others within the group will use it to iterate and share their interpretations. Using these types of personal narrative in learning can help us to chart our own evolving thoughts and ideas. Maybe it’s the bridge between the short and the longer term view. This entry was posted in 'Just in time' learning, Adaptability, Agile, Challenge, Change, Change Management, Continuity, Curation, Future, Ideas, Information, Knowledge, Learning, Meaning, Narrative, Perspective, Planning, Reflection, Social Capital and tagged Change, Competence, Long Term, narrow perspective, Organisational Development, reflective skills, Short Term, Skills. Bookmark the permalink. I like this way of summarising the future- present dilemma in looking at OD and organisational capabilities. As someone who is not a fan of the word competencies just to point out as I was at same discussion yesterday , that this is in my world “Organisation Capabilities” not competences and its not what individual but capabilities the organisation has or needs to have in the future depending on whats changing in its market and field . It’s interesting: from my perspective, the organisation is indivisible from the people. This is a subject i explored in ‘Amsterdam Diary, an exploration of learning culture’ [http://www.smashwords.com/books/view/248681], where i tried to see if culture existed independently of the people within it, or if it was simply an expressionn of the collective will. In the discussion yesterday, we looked at co-operative businesses, where the ‘owners’ are the ’employees’, which brings a whole deeper dynamic to whether you can separate the two. For me, the more concrete part of the conversation was in looking at how today’s needs drive us towards applied skills, but we need to set aside time to master the deeper, more reflective skills that let us shape that future organisational capability that you talk about.